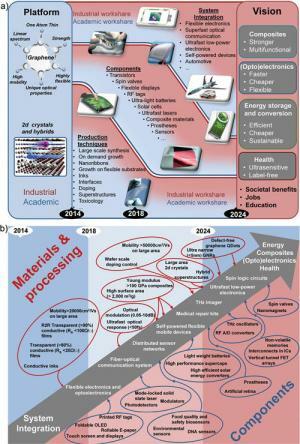 A science and technology roadmap for graphene, related two-dimensional crystals, other 2d materials, and hybrid systems was put together in a joint effort by over 60 academics and industrialists. The roadmap covers the next 10 years and beyond, and its objective is to guide the research community and industry toward the development of products based on graphene and related materials. The roadmap highlights three broad areas of activity. The first task is to identify new layered materials, assess their potential, and develop reliable, reproducible and safe means of producing them on an industrial scale. Identification of new device concepts enabled by 2d materials is also required, along with the development of component technologies. The ultimate goal is to integrate components and structures based on 2d materials into systems capable of providing new functionalities and application areas.Eleven science and technology themes are identified in the roadmap. These are: fundamental science, health and environment, production, electronic devices, spintronics, photonics and optoelectronics, sensors, flexible electronics, energy conversion and storage, composite materials, and biomedical devices. The roadmap addresses each of these areas in turn, with timelines. 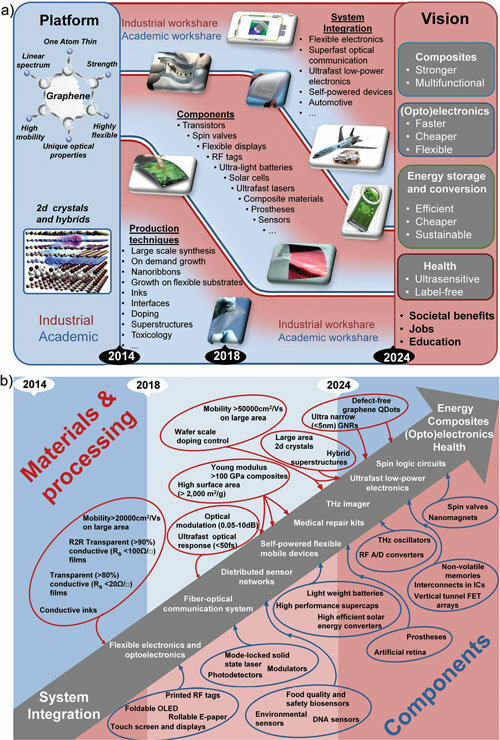 Roadmap timelines predict that, before the end of the 10-year period of the EU's Graphene Flagship, products will be close to market in the areas of flexible electronics, composites, and energy. Advanced prototypes of silicon-integrated photonic devices, sensors, high-speed electronics, and biomedical devices are expected.